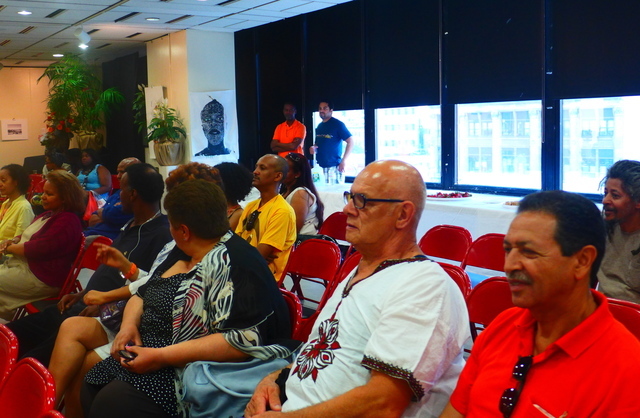 New York (TADIAS) – The 10th anniversary celebration of the Sheba Film Festival in New York concluded on Saturday, June 22nd with a reception and an art exhibition held at The Adam Clayton Powell, Jr. State Building in Harlem. The event entitled Children of Sheba Art Show featured works by local Ethiopian artists including paintings by Miku Girma, Ezra Wube, Maro Haile, Zebeeb Awalom, t-shirt designs by Beniam G. Asfaw, jewelry by Lydia Gobena (owner of Birabiro) and photographs by Tigist Selam. Here are photos from the closing exhibition held on Saturday, June 22nd.